I have shot these Elite Tactical Systems Glock magazines lots over the past few months. My G19 and G17 have had a workout with all types of ammo, and I have good things to say about the ETS polymer magazines. If you wanted an alternative to the Glock OEM magazine, the go to company was Magpul with their Glock PMAG line. When they introduced these magazines it was a big deal as non-OEM Glock magazines haven’t been a trustworthy or successful item in regards to price / quality. I have shot many rounds out of my PMAG17 magazines… I know they perform well, but when a competitor like ETS group comes around with another polymer magazine, we can’t help but ask… which one is better? When it comes to price, both magazines are pretty close to call; Magpul’s G17 mags typically retail for about 15.15 and the ETS magazine running 16.99 on their website. Not much I would sweat over unless I was buying bulk. The dollar or so difference is not a issue with me as I typically order a mag at a time when I order gun parts or accessories. I call it a self-imposed magazine tax. The differences between the two extend to more than price however, as the defining feature of the ETS group Glock magazine is the clear body. Round count for PMAG17 is… less than 17 but more than 2 visible from the top of the mag. Round count for ETS GLK magazine is… exactly 10 rounds. Nifty. Being able to check a round count with a mag drop is a nifty feature. The opaque black Magpul magazines lose a point here as they have a single witness hole for a full magazine. How many rounds are left in your Magpul magazine? If it’s not at full capacity, it’s a guess. How many rounds are left in your ETS magazine? Check it instantly and you have a clear visual indicator in seconds. The GLK 9 22 round magazine is in the Goblin Smasher while the 33 round GLK-33 sits patiently below. The clear body is only the most notable feature, but the ETS group magazines also utilize stock Glock pattern floorplates. If you want to add a magazine extension from your stockpile, you pretty much just swap the plate and their isn’t going to be a compatibility issue. The Magpul G17 mags are a different story. Of course Magpul would use a new floor plate that isn’t compatible with what has been produced for years. Of course. Magpul has only recently started offering accessories for their proprietary floor plate, to include a rubber “L” plate body that is basically a rubber bumper for your magazine. With the ETS magazines, being able to use any number of floorplates is possible; right form the word go you can swap out the stock plates for the aftermarket gear as you see fit. Moving further on, the stock plates on the ETS group magazines have a sharp ridge that allows the finger to grab a flush fitting magazine with a bit extra traction to the fingers. Ripping that magazine out to clear a jam is easy and effortless. 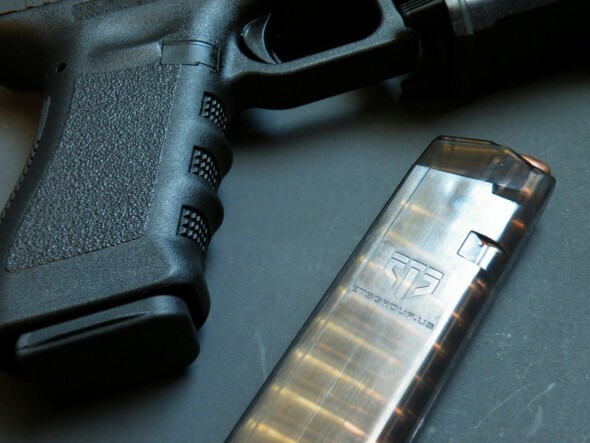 Magpul’s Glock magazines offer a similar stepped ridge that allows the shooter a bit more purchase than a stock Glock magazine. The question as to which floorplate is better is going to boil down to a personal preference and I can’t find fault with either here as both are improvements over the stock Glock OEM mag. The ETS magazine ran without issue for hundreds of rounds. I estimate in total 500-600 rounds went through the testing magazines through a G19 and a G17. I was sent several samples, a 31 round mag, a 22 round mag, a 17 round magazine, a 15 round G19 mag, and a 10 round G26 magazine. The magazine that saw the most action was the 22 round magazine as it had the capacity to make shooting my SSM equipped G17 feel like a bullet hose. I ran that magazine lots and its my favorite G17 magazine by far. The fit of the ETS magazines in kydex is a bit different from OEM or Magpul mags. The fit is a bit tighter, or at least feels as though there is more contact between the kydex and mag body of the ETS mags. They don’t feel as though they snap into the kydex, instead they slide in with what I presume to be more contact with the kydex due to a slightly larger magazine body diameter. Test kydex was Bravo Concealment and Vigilance Tactical Glock mag holsters. In a generic molded plastic Glock mag holder, the ETS mags are the snuggest fit of the three. Do I believe this is a performance issue? Not really… unless you already have some kydex which is so tight on OEM mags that you have to pry it out with a mult-tool, then it may be an issue. The ETS magazines seem to have more of a friction fit before they snap into the ridges of kydex magazine holders, but retention was not a problem. These magazines are, as simple as I can say it, good to go. Both ETS and Magpul make a reliable magazine with differing features. Both are outstanding products at a much cheaper price than OEM. So which to choose? I am moving to buy more ETS magazines as I like the mix of features for the price. They are clear which makes it easy to count rounds, they are reliable, use stock Glock components, and still more affordable than stock Glock magazines. Bottom line is that ETS Group has produced another winner for the consumer as they are delivering a solid product. My only recommendation to ETS group is to send these out with a bright orange, green, or yellow follower for quick checks on an empty gun when the slide locks back. Otherwise, it seems to be a solid product. Want a free ETS GLK-26 (for the Glock 26) magazine? Then comment below and share my review! I will pick a winner at the end of the month! Very curious to see the long term reliability on these. One of my cc’s is a G26. I’ve been very happy with the MagPul offerings. Not sure I will try these ETS mags. The base plate issue is a big deal if you ask me. Glock base plates are a pain to remove. Making cleaning chores .. well .. a chore. The MagPul base plates .. are a breeze. Making cleaning after use in my suppressed glocks so easy. Does it require excessive force to load ten in the G26 mag? How easily does it seat when fully loaded? I actually cannot comment on how difficult it is to seat the G26 magazine as I don’t have a G26, but the last round was hard and I nearly busted out my loader to assist, but I got it with finger pressure. Honeycomb does indeed own a G26 so after confirming that he did I did a simple coin toss to the ground. Mack won the magazine! I got the ETS mags a couple of month ago. Initially loved the fact that they were clear and would be easy to distinguish during matches when I’m dropping mags on the run. I ended up hating them. Well, maybe hate is a strong word, but they’ve given me a bunch of trouble. I don’t find that the notch at the top is as deep as OEM mags and have had them fall out on me. I have to REALLY tap them in during reloads. I just switched over to the PMAGS and have been really happy with them so far. I will say though, everyone on the range does love the look of the ETS, I always get questions when I’m running them on my belt. For large volume training purposes saving money might be a consideration in reasons for not sticking with OEM. But for critical tools like equipping your CHL, OEM is the only way to go. No question. Why mess around. ← Trouble In High Power Land: Learning ‘Bout Optics!